The Leeds School of Business at CU, Boulder is based at a university that’s creating the industries of the future – on a campus with four Nobel Prize winners – and in a city that’s rated as one of the nation’s top five for business creation. Those powerful assets are reflected in the School: Top-rate academics in business functions, opportunities to connect across campus and around the world, and an emphasis on programs that develop students’ skills for professional impact, and tastes of how business creation and growth happen in the real world. Leeds is also a center of innovation. In our community, faculty specialize in it and companies we work with show how it’s done. Our community, both the school and the city, attract inspired people who come up with inspiring ideas. All this gives Leeds an edge in developing confident, exceptional performers—Leeds people are ready to conquer the tough job market and the huge challenges of a shifting global economy. Leeds people are drivers of value creation for business, nonprofits and society at large. We’re rooted in social responsibility and ethics, with the most fully integrated student development in this area of any school in the country. To help ensure students get the most out of what Leeds has to offer, we provide a personalized “whole student” approach. We help students find the right focus and get the most out of a big university by working with them one on one. We have one of the best mentoring programs in the US, connecting students with working professionals. We also offer top-rated career and academic advising services. And we have active partnerships with companies who help with our programs and bring great job postings for students. Boulder is also one of the most beautiful settings in America, with stunning vistas and amazing opportunities for recreation and inspiration. We’re within easy reach of other places that make Colorado a global destination, including Denver, Aspen and Vail. The Leeds School of Business at CU, Boulder is based at a university that’s creating the industries of the future – on a campus with four Nobel Prize winners – and in a city that’s rated as one of the nation’s top five for business creation. Those powerful assets are reflected in the School: Top-rate academics in business functions, opportunities to connect across campus and around the world, and an emphasis on programs that develop students’ skills for professional impact, and tastes of how business creation and growth happen in the real world. Leeds is also a center of innovation. In our community, faculty specialize in it and companies we work with show how it’s done. Our community, both the school and the city, attract inspired people who come up with inspiring ideas. All this gives Leeds an edge in developing confident, exceptional performers—Leeds people are ready to conquer the tough job market and the huge challenges of a shifting global economy. Leeds people are drivers of value creation for business, nonprofits and society at large. We’re rooted in social responsibility and ethics, with the most fully integrated student development in this area of any school in the country. To help ensure students get the most out of what Leeds has to offer, we provide a personalized “whole student” approach. We help students find the right focus and get the most out of a big university by working with them one on one. We have one of the best mentoring programs in the US, connecting students with working professionals. We also offer top-rated career and academic advising services. And we have active partnerships with companies who help with our programs and bring great job postings for students. Boulder is also one of the most beautiful settings in America, with stunning vistas and amazing opportunities for recreation and inspiration. We’re within easy reach of other places that make Colorado a global destination, including Denver, Aspen and Vail. When selecting their incoming class of 60 students, admissions officers at Leeds seek out applicants "with a wide variety of backgrounds—both educational and professional. We are not looking for specific work experience in a certain field or for a particular undergraduate degree. Rather, we look for applicants who have compelling reasons to earn...When selecting their incoming class of 60 students, admissions officers at Leeds seek out applicants "with a wide variety of backgrounds—both educational and professional. We are not looking for specific work experience in a certain field or for a particular undergraduate degree. Rather, we look for applicants who have compelling reasons to earn an MBA and who will add perspective and experience to their classmates' experiences." The average GPA of this diverse group is a 3.31, and the average GMAT is 648. The student body is 27 percent female, 73 percent male, and 19 percent international. The TOEFL exam is required for international students, and the minimum score is 250 (computer-based) and 600 (paper-based). Pretty much all Leeds students agree that living in Boulder can't be topped. Ranked "Best Place to Live" by Money magazine, Boulder hosts just over 96,000 residents, and yet is home to multiple high-technology businesses, natural beauty, and multiple cultural institutions. Students say "There is no nicer place to be a student than Boulder, Colorado. The campus is beautiful, architecturally significant, and safe. The school is situated in the foothills of the Rocky Mountains, and world-class ski resorts are but an hour away. The social scene and nightlife are fantastic, and Boulder has an eclectic mix of cafes and restaurants." School or student-organized events include "TNO [Thursday Night Out] at a different bar every week, free tailgates before every football game, a night hike/snowshoe/cross-country ski trip every full moon, and an annual retreat that is a traditional highlight of the year. It's never long before the next event, and with our location, the opportunities are virtually endless." The only problem with life at Leeds, it seems, is the building in which the school is housed, which students say is "horribly ugly and has a bad feel to it." State funds were allocated to the school, but "held back during the recent budget crunch." Students have high hopes, though, that with money from the Leeds family, a new building will soon be in the works. The school only recently appointed someone to the position of Director of Alumni Relations, and so students occasionally complain about the "lack of alumni network." How bad can it be, though, if alumni are donating $35 million to the school? Though students might gripe about the efforts of Career Services, 85 percent of the graduating class of 2002 had found employment within three months of graduation, and the average salary as about $69,000. About 28 percent of students who were hired received a signing bonus, and the average bonus was almost $15,000; 19 percent of the graduates started their own companies, and about 33 percent ended up working for very small companies (between 2 and 50 employees). At the Leeds School of Business, innovation and creativity add to a strong foundation of business theory and practice made relevant in competitive local, national, and international markets. Leeds has built a national reputation for its strength in core business disciplines and specialty programs in entrepreneurship andreal estate. Leeds offers full-time MBA, Evening MBA, and Executive MBA programs. 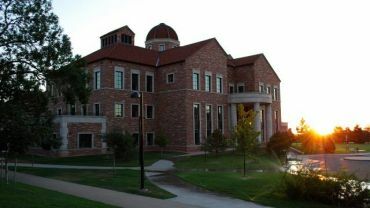 In 2001, the business school at the University of Colorado—Boulder received a $35 million donation—the country's sixth largest such donation in history—from the Leeds family of Long Island, New York (two of the sons attended the school). The school, originally founded in 1923, was renamed the Leeds School of Business as a result, and students feel confident that the huge influx of money "is working to bring top-tier professors to the university, so quality will continue to improve." The program is small, with only about 50 students per class, and each class is divided into two cohorts of about 30 students. As a small school, "Leeds has both the advantages (small class size, easy course access, access to professors, access to entrepreneurship and real-estate center staff) and disadvantages (limited course offerings, reduced access to large corporate recruiters) that are part and parcel of the small school experience." But most agree that the small size lends an intimacy and familiarity that will ensure their future success. "The high caliber of students and faculty is rare for a program of this size," says one student. "Definitely a great group of people that don't take themselves too seriously. If you are looking for a group of people who understand [that] life should be balanced (after first semester), you will love it here." Leeds has only nine required courses and nine electives, and students can choose to take two electives in the spring of the first year. The second year is mainly electives—only two required classes, but the program is very quant-heavy, and students who don't come into the program with a strong background in statistics, college-level algebra, and principles of microeconomics are advised to take college-level courses in these subjects before they enroll. Students say that both the "entrepreneurial course work and real-estate course work are excellent." Leeds offers more than 25 "career tracks" or sets of electives designed to lead students down specific career paths. Some career paths include "corporate finance, financial consulting, social and ethical venturing, entrepreneurship, real-estate capital markets, marketing management, operations management, and corporate entrepreneurship." When following one of these career paths, students are allowed to enroll in graduate classes in other schools on the university's campus. Dual-degree programs such as an MBA/JD, an MBA/MS in telecommunications or computer science, and an MBA/MA (in anthropology, fine arts, or Germanic languages) are available. And exchange programs are offered at any of the following locations: the ITESM (Monterrey Tec) located in Monterrey, Mexico; and the Instituto de Empresa, located in Madrid, Spain. Leeds also hosts specialized centers devoted to entrepreneurship, real estate, and financial markets. Students warn, however, that course selection is important: "The professors are a mixed bag. Sometimes you get duds; other times, rock stars." And others amend this by saying, "The majority of professors are very good, but the administration has been unresponsive to students' complaints about the occasional inadequate instructor." Some say that they'd like to see the teaching style change a bit. "The largest flaw in the academics is not the workload, the professors, or the administration, but the classroom style. Even in case studies, there is limited class debate—this is certainly something that must be directly addressed and changed." Want more info about University of Colorado, Boulder, Leeds School of Business Full Time MBA? Get free advice from education experts and Noodle community members.